A simple change led to higher pressure and stabler plasma. A team of scientists achieved high pressure plasma — perhaps laying the groundwork to achieve fusion power, according to a terrific explainer by Ars Technica — at an old fusion reactor in San Diego by reversing the orientation of the vessel that houses the plasma. Despite the promising results, whether or not the modification will lay the groundwork for useful fusion power in the future is still far from certain — but, at the very least, it’s a fascinating example of squeezing interesting research out of dated equipment. One possible route to practical fusion power takes the form of a massive and highly complex device called a “tokamak reactor,” which confines high energy magnetic fields to control charged particles called plasma. Once both temperature and pressure levels are right, colliding particles release massive amounts of energy — or at least that’s the idea. For the first time, researchers are finally inching closer to getting more energy out than they put in. 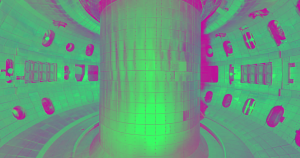 The San Diego team — whose paper on the findings was published in the journal Physical Review Letters — flipped the orientation of the plasma chamber of an old tokamak reactor called DIII-D, which has been in operation since the 80s. The result, according to Ars‘ analysis, was surprising: pressure ramped up enough to meet the requirements for fusion power reactions to occur, with energy levels much higher than expected. The plasma was also more stable — a big deal when it comes to observing fusion reactions inside a tokamak. But since scientists understand how the machines scale, a bigger fusion reactor could prove to be even more promising. The scientists are hoping to try a similar experiment, but with ramped up power. Maybe the result will surprise them again.